As the first Apple Store to open its doors in the region of China, the flagship location at the IFC Mall in Hong Kong finally enabled Chinese access to Apple products, which had been in demand for quite some time. The style of the store is very reminiscent of other Apple Stores, including a spiral staircase enclosed in a glass cube that leads from the 1st to 2nd floor of the store. Opening in the popular IFC Mall brought this Apple Store to the forefront of the Hong Kong shopping district, and ensured that millions of consumers would pass by its front doors every year. But before this new Apple Store could be built within the mall, at least 9 other retailers had to sign over their leases and several walls had to be knocked down in order to accommodate the space that the store required. The IFC Mall gets its name from the area in which it is located – the International Finance Centre – a commercial development area on the waterfront of Hong Kong in the Central District. The abbreviation of “IFC” for the mall is part of the branding for the mall itself, but the acronym also refers to the actual district and not just the mall. The IFC District includes two massive skyscrapers, as well as a robust public transportation and elevated walkway system. The IFC Mall in Hong Kong is a magnet for shoppers, attracting those who want trendy shops or high-end luxury store and designers. The space surrounding the IFC Mall includes some of the most exclusive office space in Hong Kong, in addition to outlet stores for highly sought-after international brands, and respected businesses such as the Four Seasons Hotel which is an astounding 55 floors. Part of the allure of the IFC Mall is the accessibility of its shopping and dining options. In addition, there is a network of covered and elevated walkways that connect not only sections of the mall, but that lead to several other upscale malls and venues. The mall is also connected to popular piers and is located above a transportation hub, putting the Apple Store within walking distance of many of the most popular places in Hong Kong. One of the most important things to know before you go to Hong Kong’s Central District in search of the Apple Store is that the area is infested with many knock-off stores claiming to carry genuine Apple products and provide verified Apple services. 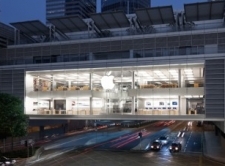 The real Apple Store is located in Central District within the walls of the IFC Mall. Once there visitors should be able to find many sales at the shops within IFC, particularly during the months from December until February, which is the time between Christmas and Chinese New Year. There are many options for getting to the IFC Mall because underneath it is the hub for the Airport Express Hong Kong Station, where you take Exit F to reach the mall. If you are going by way of the MTR Central Station, take Exit A. If walking is more your style, you can reach the mall via a 10 minute stroll on the elevated walkway from the Hong Kong-Macau Ferry Pier. An even closer starting point is the Star Ferry Pier which is a quick three minute walk through the walkway.